Water Wise It ™ – Creating a Water-Wise Lawn! Which type of soil offers the most balanced profile for water filtration and retention on a lawn? In Utah there are three basic soil profiles; Sand, Sandy Loam and Clay. To figure out what type of soil you have do a quick spit test. Take a hand full of soil, spit into it (or just add some water), and mix the water in with your finger. If the soil resists balling up it is probably sandy soil. If the soil creates one big ball of mud it is likely Clay. If the mixture creates several little balls of mud it is sandy loam. 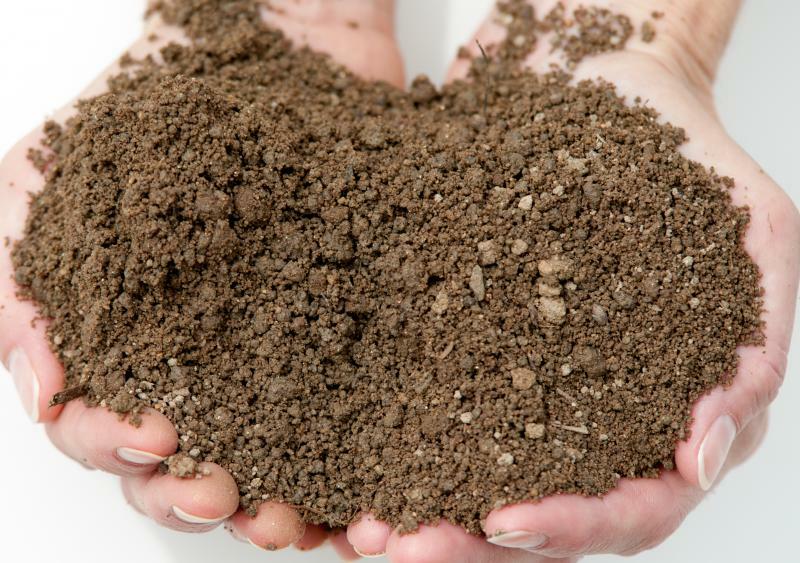 Sandy Loam is the most desirable type of soil, because it retains water and resists compaction (compaction prevents moisture from filtering down through the soil). 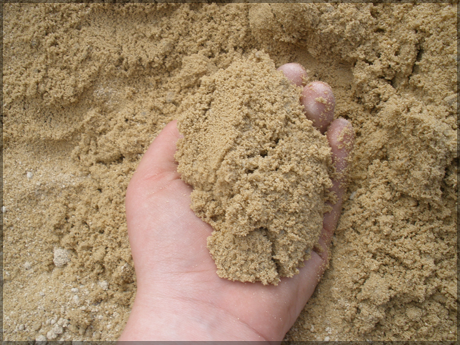 Sandy loam consists of the three materials found in soil: clay, sand, and silt. 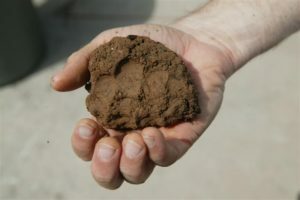 Sandy loam in contains approximately 25% clay, 50% sand, and 25% silt. Sandy loam provides the best balance of water drainage, water retention, resists compaction and allows Air, Water, and Nutrients easier access to roots. Clay affects soil the most as it affects compaction, infiltration, and drainage depending on the amount present in the soil. Too much clay in soil will inhibit internal drainage, while too little clay will prevent the soil from holding water long enough to be absorbed. Non-compacted soil will allow turf grass sod to more easily establish deep root systems and will increase the overall health of your lawn. If you have a different kind of soil don’t despair, it’s an easy fix to modify your soil before planting. Prepare your soil bed 6-8″ with Sandy Loam Soil before planting a lawn or laying sod. You can modify a current soil profile by adding fully composted material to the soil. Worms and bactifeed can also help to break down and modify soils. Most hardware stores and nurseries carry soil test kits. You can use these to determine the actual composition of your soil. These soil tests also identify what nutrients are needed for proper turfgrass health. Anyone can develop an excellent lawn with the addition of organic matter, fertilizer, and proper soil preparation. After you’ve modified your soil be sure to pre-water before installing sod! This not only settles the soil but it’ll help establish a healthy lawn and will require less water to establish the sod. If you have specific questions about soil composition and how it affects your lawn please contact Chanshare Farms by emailing larry@chanshare.com or by calling 866-SOD-EASY. Maintaining a healthy lawn is the best defense against weeds and foreign grasses. Follow these maintenance tips to create a Healthy, Water-Wise Lawn. Having a perfectly weed free lawn is an unrealistic expectation and should not be something to get frustrated over, but measures definitely can be taken to improve your yard. The best measure for controlling weeds is to create a healthy lawn and care for it with proper maintenance practices. Proper fertilizing, aeration, mowing, and irrigation all promote the healthy growth of the grass in your lawn. Have you ever found mushrooms on your lawn? The cause is over watering or poor drainage! Watering your lawn properly will not only help it look greener, but it will help control common diseases and weeds that would otherwise become present like mushrooms. Overwatering a lawn is one of the leading causes of excess thatch (which prevents air water and nutrients from reaching the roots of your lawn) and mushroom growth. When you have standing water on your lawn, caused by compacted soils not allowing filtration or over watering, you will often see mushroom growth. Decrease the amount of water on the affected part of your lawn and aerate if necessary to fix the problem. Aeration should be done on every lawn at least once a year, preferably in the Spring. If you have a soil bed that compacts easily 2-3 times are recommended, either Spring and late Fall, or early Spring, mid-Summer, and Early Fall. Sports Fields, Parks or any lawn that receives heavy foot traffic can benefit from 2-3 aerations in a year. Plug aeration is recommended for residential lawns and moderate traffic lawns. Sports fields are usually installed over sandy or sandy loam soil and can benefit greatly from deep tine aeration. 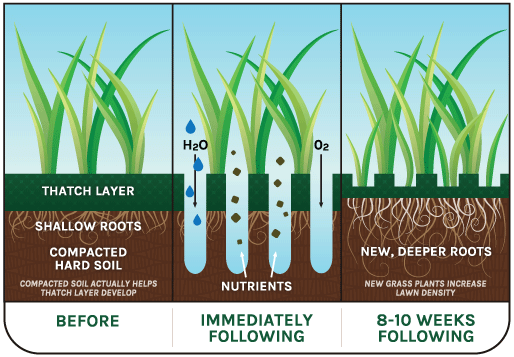 Aeration loosens up soil and allows Air, Water, and Nutrients to be easier access to the roots of the lawn. This also allows the lawn to build a stronger root system which chokes out weeds and foreign grasses. Mulch your clippings! As mentioned above mulching your clippings will return water and organic material to your lawn and decrease the amount of fertilizer you need to apply. Mow 2-3″ high. A longer lawn will promote deeper roots, decrease evaporation by shading the top of the soil bed, and give your lawn a softer feel. Sharpen your blade at least once a year. A dull blade will tear the blades making it harder for the lawn to regrow. If your blade is dull you will notice the ends turn yellow shortly after you mow the lawn. A sharp blade will help your lawn to regrow quicker and remain green longer. Never mow more than 1/3 of the blade at a time. 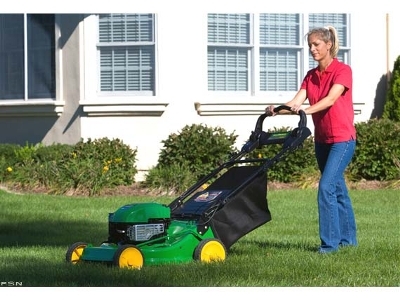 Mowing more than this will put your lawn into shock and all the plants energy will be refocused on regrowth of the blade which will prevent your roots from growing as quickly. Mow in different directions each time. This will give your lawn a more uniform appearance and will help prevent compaction. Watering your lawn is not a difficult process. The average homeowner in Utah applies upwards of 50″ of water to their lawn each year! However, a healthy cool season lawn can remain green through the heat of the summer with 24-26″ of supplemental water each year. Follow the watering guide below to minimize the amount of water you apply to your lawn. Unless you start following this watering guide early in the spring you may not be able to follow this watering guide completely. 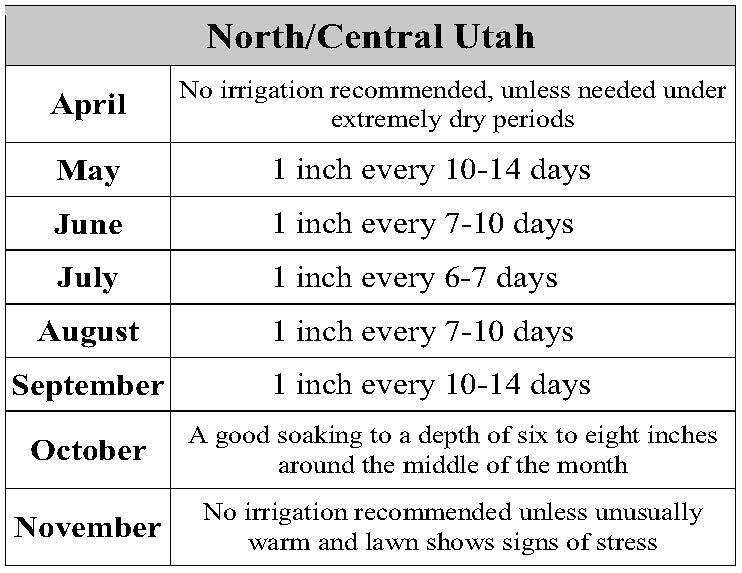 If you lawn cannot survive on this schedule you can start adding days between watering and lengthening the time your sprinklers are running on those days, then decrease the amount of water applied to your lawn once it is trained to go longer between irrigation, to arrive at the recommended amounts. Below the Lawn Watering Chart are some other great tips. Don’t water when there is precipitation in the forecast! Watering during a rain storm is one of the most idiotic things you can do. If you will not be available to shut off your system when it rains install a soil moisture sensor or Evapo Transpiration Sensor that will shut off your system automatically when it rains. Water longer and deeper. 1″ of water applied in one day every 8 days creates a stronger lawn than applying 1/4″ every other day. Deeper watering creates a deeper, stronger root system. Don’t set your system and forget it. The best way to decrease the amount of water you apply to your lawn is to shut off your automatic system and only water when your lawn shows signs of stress. If you cannot easily push a screwdriver into your soil about 6″ your soil is dry and you need to apply water. Also, if you can see footprints in your lawn after 60 seconds that is a sign that the blade structure is weak and the lawn needs water. 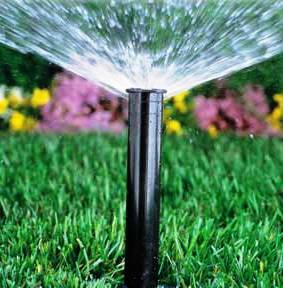 Change the frequency and amount of water monthly to ensure that the lawn is not being over watered. Only water sections that need watering. If you have a single spot in your lawn that needs more water, use a hose-end sprinkler to water that spot rather than watering your whole yard. After maintaining your lawn as recommended if your lawn is still struggling a turfgrass expert can evaluate your lawn to determine what best. They can test your soil composition, the efficiency of your irrigation system, and may recommend hand-weeding. pre-emergent herbicides, and post-emergent herbicides. While hand-weeding is by far the most tedious it is also the most environmentally friendly and effective method to get rid of weeds in your lawn. Herbicides have many uses but in all cases should be used sparingly. To see the most common weeds for cool season lawns visit the Chanshare Lawn Care Guide at chanshare.com. If you have any specific question on how to Water-Wise your lawn please email larry@chanshare.com or call 866-SOD-EASY. How often should I apply fertilizer to my landscape to keep it green? It actually depends on what kind of lawn you want, but if you want a Water-Wise lawn then 2 times should be enough for a perfectly green lawn. The fall application of fertilizer is absolutely essential for the greenness of your lawn. If you apply fertilizer late in the Fall (sometime around Halloween) you should be able to wait until late May before you fertilize again. Then in the spring all you will have to worry about is weed control. Apply approximately 3-4# of nitrogen per 1,000 Square Feet per year to keep your lawn healthy. Late fall is by far the best time to fertilize in cool season environments, regardless of the type of maintenance program the lawn falls under. Research has shown the benefits of this late fall fertilization after grass growth has slowed but the lawn is not yet dormant, because roots continue to grow after winter sets in. Spring applications are suggested around the end of May. Fertilizing too often or using too much fertilizer increases the likelihood of harmful chemicals running off into streams or seeping into groundwater. The combination of over-watering and over-fertilizing can be dangerous to plants, animals, and people. Fertilize as sparingly as your lawn allows. Chanshare Sod Farm’s Fertilizing_and_Watering Guide can be downloaded here. There are three main nutrients that are recommended for every lawn: Nitrogen (N), Phosphorous (P), and Potassium (K). Nitrogen is the key nutrient that aids in photosynthesis, but too much and your lawn will experience heavy top growth. On any fertilizer bag, Nitrogen is the first number listed followed by Phosphorous and then Potassium. For example a 24-6-12 fertilizer contains 24% nitrogen. Industry recommended ratios for fertilizer is 4:1:2 for mid season applications. Fall applications should be balanced with a higher Potassium content (i.e., 16-16-16). No fertilizer is needed for the months from November through May, as long as you apply fertilizer late in the fall. As you can see in the above graphic the best time to affect the root growth of your lawn is in the middle of the spring and the fall. Don’t apply fertilizer when temperatures are higher than 85 degrees Fahrenheit as this will promote unnatural growth and could cause the lawn to burn. Over-fertilizing can cause excessive growth, seed development, and can be harmful to the environment, causing serious damage to the ecosystem. For more Care Tips for your lawn or to learn how to Water-Wise It™ download our lawn care guide at www.chanshare.com or send specific questions to larry@chanshare.com.